See also Notes on Inverter Model. For inverters, the program automatically assigns the names INV-1, INV-2, INV-3, and so on. Input Bus The DC bus to which the inverter connects, which must already exist on the one-line. For your reference, the Input Bus base kV is displayed next to the bus name. The AC bus to which the inverter connects, which must already exist on the one-line. For your reference, the base kV is displayed next to the bus name. kVA Rated output kVA of the inverter. X/R X/R ratio of the inverter short circuit contribution as seen from the load side. IGBT / Thyristor Type of inverter. 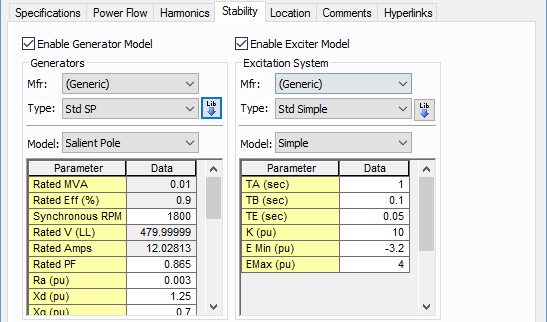 This affects power flow simulation methods. If IGBT, there are three control modes possible. For Thyristor, the output real and reactive power conditions are simulated using Kimbark’s equations. Fault x FLA Maximum fault current expected on the load side in multiples of the full load amps (FLA) rating. Fault Time Duration the inverter can supply the fault current. The time can be specified in cycles or seconds. Stand Alone: The inverter will supply any amount of required load, just like an AC grid Swing Bus. The specified voltage magnitude (Ctrl kV PU) and angle (Ctrl Angle) will be maintained. You should carefully check the capability (limits) of the inverter. Voltage Controlled: This model supplies the specified amount of kW to connected system, keeping the voltage magnitude at specified value (Ctrl kV PU) on the load side bus. There must be a Stand Alone system present when an inverter is operating in Voltage Controlled mode. Specify the kVAR Min and kVAR Max limits for the inverter. Const PQ Output: This model supplies the specified amount of kW and kVAR to connected system. There must be a Stand Alone system present when an inverter is operating in Const PQ Output mode. Specify the kVAR Min and kVAR Max limits for the inverter. Ctrl kV PU The per unit magnitude of Inverter output voltage. This is maintained at the specified value for a Stand Alone model, and is maintained at the specified value while within var limits for a Voltage Controlled model. Ctrl Angle The angle in degrees of the controlled output voltage for Stand Alone model. Eff Efficiency of the inverter. 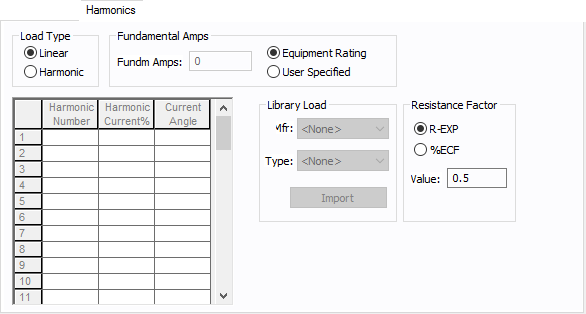 This is the ratio between output and input power in percent. kW Specified controlled output active power in kW for Voltage Controlled and Const PQ Output models. kVAR Specified controlled output reactive power in kVAR for Const PQ Output models. kVAR Min Minimum kVAR capability of the inverter in voltage controlled mode. kVAR Max Maximum kVAR capability of the inverter in voltage controlled mode. For an IGBT inverter only, if the DC voltage on the input to the inverter drops below this value, then the inverter begins stepping its specified kW loading down until the input voltage rises above Min Voltage Threshold. Note: The power flow will not solve when loading on photovoltaics causes them to experience a severe terminal under-voltage. Therefore, this special control was added so that inverters fed by photovoltaics reduce load when voltage drops below VMP so that photovoltaics are required to supply less power, thus helping the DC voltage on the photovoltaics increase into a range where a power flow solution can be reached. Gamma Min Minimum inverter margin angle in degrees for thyristor type inverter. 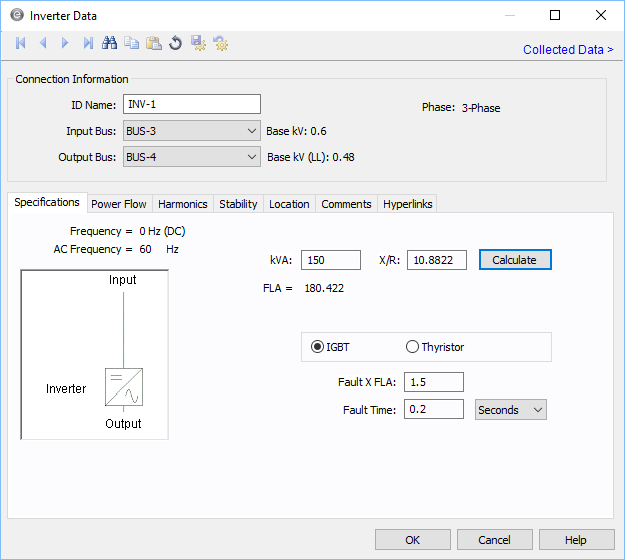 Gamma Max Maximum inverter margin angle in degrees for thyristor type inverter. Commutation impedance used to calculate the power flow using Kimbark’s equations with Thyristor type. The inverter must feed a dedicated transformer that matches these same values one-for-one. Z1: Commutation impedance in percent on kVA base specified below. This must correspond to the downstream transformer. X/R: X/R ratio of the commutation impedance. This must correspond to the downstream transformer. kVA: kVA rating base for Z1. This must correspond to the downstream transformer.